Celebrating 70 Years of Community Service…. IODE Spring Fundraiser- plants & gift cards. Boston ferns, Fuchsia plants and geraniums now. Mixed Hanging baskets and larger planters are also available at last year's prices. Gift cards to our local nurseries are available this year. Pick up date is Wednesday, May 8, 2019 for pre-orders. Petrolia Victorian Porches and Verandas Luncheon is Saturday, June 8, 2019, 12:00-2:00 pm. Advanced Tickets only... $25 "Enjoy the magic of yesteryear with an elegant lunch served in grand style on a beautiful private Petrolia veranda." Proceeds are given to a local school's nutritious snack program. 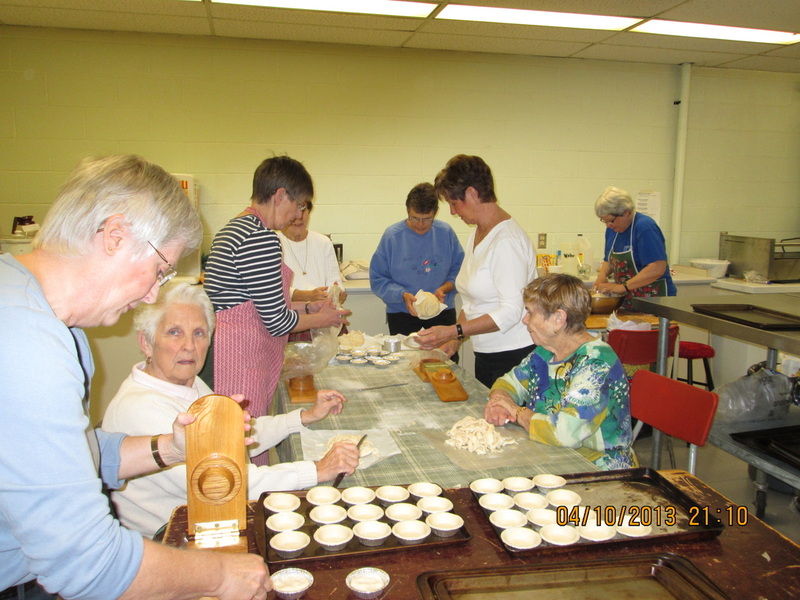 Deep dish apple pies - Thank you for your orders and support for our projects. IODE Quilt Show: October 12 and 13th, 2018 at Chris Anglican Church, Petrolia, Oil Street, Petrolia Over 180 quilts were on display. Thank you for your support. Stay tuned for 2019 dates. Fiery Faces- October 27th 2018- IODE Margaret Stoke assisted Fiery Faces for their Halloween Week of fun and games for everyone. October 27th was the Fiery Faces Family Day at DeGroot's Nursery. Thank you for your support in making this a successful event. subject excellence and community involvement. Each year, the Margaret Stokes IODE raises funds to provide education awards, community projects, and assistance to local Women’s Shelters and Christmas for Everyone. Money is sent to the municipal, provincial, and federal levels to assist in focused projects such as “Snack Pack for the North and Labrador”, “Canadian Disaster Fund”, Labrabook, Peacekeeper Park Cabin build, and the Canadian War Vets. Donations are given to Petrolia Volunteer Firefighters for CO and smoke detectors. IODE Margaret Stokes adopted this park from the Town of Petrolia in 2001. We have maintained the park with planting and weeding to the present. Pictured are members planting. 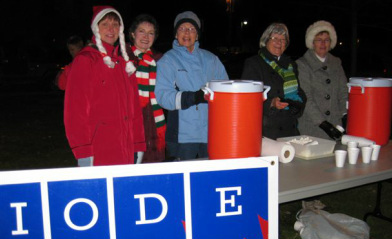 IODE Margaret Stokes members serving hot chocolate at the Petrolia's annual "Christmas in the Park". 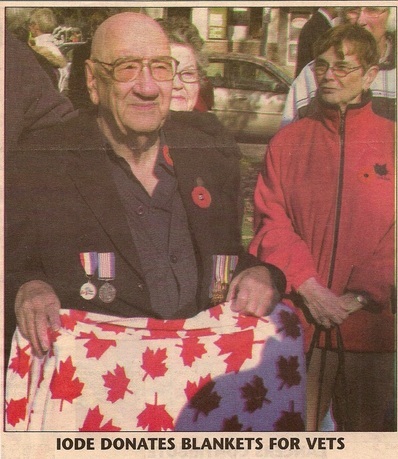 Several Maple Leaf blankets were made by IODE margaret Stokes Chapter members in Petrolia for veterans. Using one of these blankets during the Remembrance Day service is a Second World War veteran, John Nelson who served in Germany, France and Great Britain. Behind him are IODE Margaret Stokes Chapter Members, Dora MacFarlane (whose husband was a Second World War veteran) and Margaret Dee. 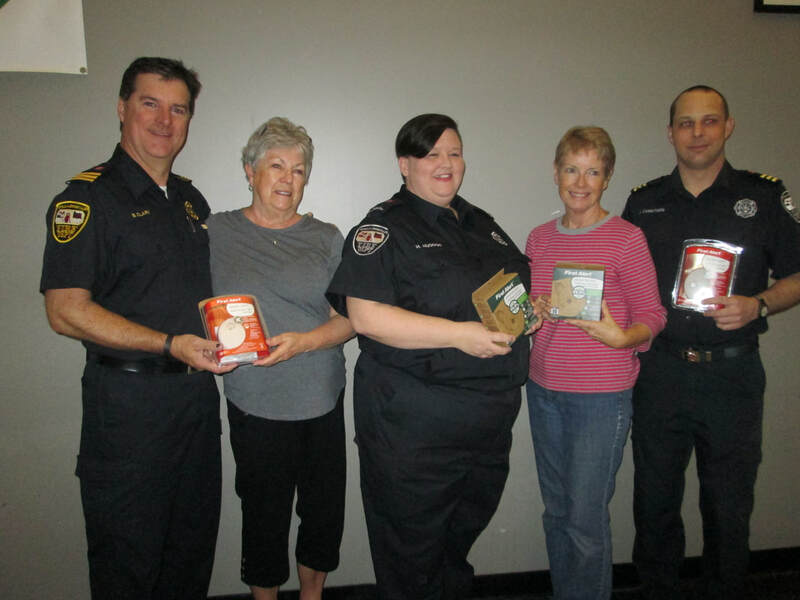 Donations of Carbon dioxide detectors to the Petrolia Fire department, April 2017. Charlotte Eleanor Englehart Hospital: June, 2014. 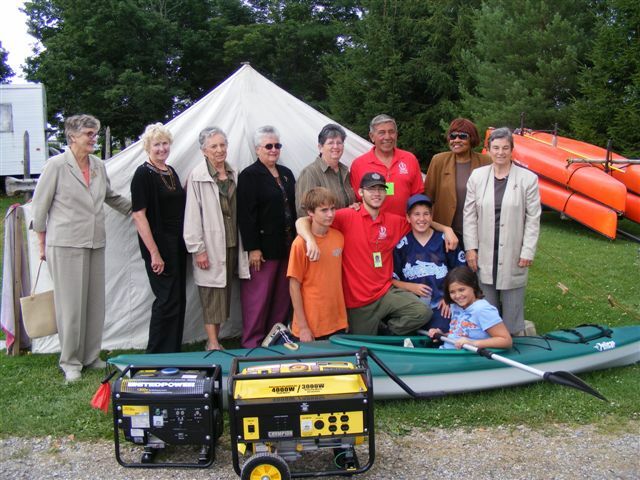 The Margaret Stokes Chapter donated funds for emergency and supply carts. An oversized wheelchair was requested last year and the Chapter was pleased to provide for it. Petrolia Community Centre Equipment: June 2014- The purchase of a Nu-Step exerciser at the Community Centre for all citizens to use without charge. T-Shirts for the Lambton Youth Choir- to go to Disney World and in 2011.